And before you say “my cat would never let me brush her teeth,” think again. Ideally, you get your cat used to having her teeth brushed when she’s a kitten, but with a little patience and persistence, even older cats will accept having their teeth brushed. I started Allegra and Ruby on a regular brushing program at ages 2 and 1, and it’s become so much a part of our nightly routine now that they will actually remind me if I forget to bring out the brush. Use only toothpastes made for cats. We use C.E.T. poultry flavored toothpaste and a pediatric toothbrush. I started out using a toothbrush made for cats, but found that the pediatric brush works better for us. The only dental treats I recommend are the C.E.T. Enzymatic Oral Hygiene Chews for Cats. They come in poultry and fish flavors. The enzymes in these treats are supposed to reduce the build up of tartar and plaque. The ingredients are not the greatest, but they’re not horrible, either. The myth that dry food keeps your cats’ teeth clean is one that just won’t die. If this were true, dentists would tell us to chew on hard pretzels! Most cats don’t chew their kibble long enough for any of the scraping action that is the theory behind this myth to kick in. What little they do chew shatters into small pieces. Some pet food manufacturers offer a “dental diet” that is made up of larger than normal sized kibble to encourage chewing, but in my years at veterinary practices, I’ve seen many cats swallow even those larger size pieces whole. Additionally, dry food leaves a carbohydrate residue in the cat’s mouth that actually encourages growth of tartar and plaque. Unlike chewing on dry kibble, chewing on raw, meaty bones can help remove plaque. Never give cooked bones to your cat, they are brittle and can splinter and lodge in your cat’s intestines. Raw chicken necks are a good size option for cats. I’ll be honest, though, I tried it once with Allegra and Ruby, and I found that even though I feed raw, the bones exceeded my comfort level. The girls were interested, but I didn’t care for them dragging the greasy bones all over the house. Allegra developed diarrhea from the rich, fatty meat that was attached to the necks. So while this may be a great solution for many cat parents, it’s just not for me. Oral rinses or gels will not control plaque by themselves, and are not a substitute for brushing. Unless you’re able to apply the solution directly to the cat’s gums, the concentration won’t be high enough to be effective. And if you’re able to apply a rinse or gel inside your cat’s mouth, why not brush their teeth instead? EFAC is a product that surprised me with its effectiveness. These gel caps contain a proprietary blend of Esterified Fatty Acid Complex, which has been shown to have a positive effect on gum health. There aren’t a whole lot of convincing studies, but after using it for Allegra for a few weeks, I’m seeing an improvement in a problem area on her gums, so I’m going to keep using it. They’re easy to use: simply open the softgel capsule, squeeze the contents on your finger, and apply them to your cat’s gums. The only drawback: the smell of these capsules is absolutely atrocious. This doesn’t seem to bother Allegra; she loves the capsules and seems to consider them a treat. Leba Dental Spray has been touted as a product that actually removes tartar and plaque, and the photos on Leba’s website are quite dramatic. There is very little information available about its efficacy for cats. If you have tried this product, I’d love to hear from you. While regular home dental care may not completely eliminate the need for a professional cleaning under anesthesia, it will slow, and possibly prevent, dental problems. Interesting article, being a cat owner, I cared about its hair and other aspects but didn’t pay attention to teeth. This article told me how important it is to keep them clean, thanks for sharing the information. I was just wondering what your views were on gingivitis – our 11-year old has a bad case and we were advised to have all her teeth pulled. Since that seems too drastic to me at only 11 and anesthesia also has its risks, while looking up holistic/natural remedies for this problem I came across homeopathy, in particular tasteless/odorless liquid additives that can be mixed into drinking water or wet food. Amazon reviews indicate that this worked for most cats and I don’t think these reviews are planted or fake, at least for the majority. We just ordered one called Oral Health for cats from King Bio and look forward to trying it. Perhaps this should be something to look into in the future since it seems to be working for many and addresses the problem from the body as a whole, not locally. Thanks. With homeopathy it is not about local treatment so it doesn’t matter if the water or food gets in contact with the teeth or gums. It is just the means to get it into the body. Anyway I’m sure most of the King Bio Oral Health reviews are legit so we are trying that for now. I also got some dental probiotic powder that is added to food, this works by outcrowding the bad bacteria in the mouth. In case if these don’t help, I’ll get back to western medicine. BTW Kormi is back to her normal self after a week of antibiotics from the vet but this was just a temporary fix. Furthermore I can’t help but wonder whether the regular brushing routine really is as good a choice as much as it is touted? As with everything, we should always consider the “joy of life” aspect. Is it worth putting our cats through the ordeal of daily brushing and taking them to the vet for dental cleanings (since from a cat’s viewpoint even just going there is an ordeal)? It seems even those who brush regularly still take the cats for dental cleanings as well. Of course it depends on the cat’s personality, but we don’t really know what they think about daily brushings, even if they don’t specifically lay it out for us. They might let us do it, but it may as well just be a pita for them, especially since it is not them brushing but the human, so even a misdirected touch or movement might cause discomfort, not even mentioning the poking around in the mouth factor in the first place. I still wonder if it is all worth it, or perhaps it might be better for both sides to find other, more friendly and efficient solutions. BTW I did check the Leba pictures mentioned in the article and reviews and although the concept itself sounds good, I’m pretty sure it is not very suitable for cats (might be good for dogs) since it needs to be sprayed directly in the mouth and also the cat should not do any grooming for 30 minutes afterwards to make sure the chemical balance in the mouth gets established. With the research I did so far, since teeth/gums seem to be an issue for the majority of cats, perhaps cat food makers should address this and add some kind of dental probiotics to their foods, or maybe this is not technically possible, I’m not sure. We feed mostly wet meat-based food (meat and organs with some minimal veggies) and some small amount of dry like Ziwipeak, Orijen and Acana and I guess adding bacteria to canned food at production might cause the bacteria to multiply in the product, theoretically could be done with dry food though probably. In any case, it should be quite important to do something on a daily basis so that the problem is prevented in the first place. I would so far think probiotics should do the job by outcrowding bad bacteria in the mouth, as a preventive measure. There are some probiotic products like Evora pet (now ProBiora pet) that have good reviews and I’m sure there are others. Various Salivarius bacteria seem to be used in these. Anyway this is long enough already, hope everyone makes good health decisions for their kitties for long happy lives. My experience with Leba has been that the taste is so awful that most cats won’t accept it. Yes I’ve seen the video. The two things I mentioned, dental probiotics and homeopathy, are two different approaches altogether, dental probiotics start multiplying in the mouth by getting in contact with water/saliva and act locally by outcrowding bad bacteria in the mouth. Products like this use Streptococcus Salivarius bacteria. I would think this is a good method for prevention. On the other hand, homeopathy addresses the problem from a whole body level so and is only supposed to be used while symptoms are present anyway, so I guess it would be good for treating existing cases. I have an appointment with a cat homeopath in a few days who will prescribe specific remedy for Kormi and we also got some dental probiotic powder. I’m looking forward to my homeopathy appointment and hope to learn some new things since my knowledge about homeopathy is minimal. I would also recommend doing what the vet recommends. If there is a lot of gum inflammation chances are there is tooth damage and that is likely to be painful to your cat and can’t be fixed by anything short of extraction. I also know from first-hand experience how dental disease can affect other organs. My first cat had a very inflamed mouth when I got her as a 6-month-old kitten. The vet didn’t recommend doing anything about it at the time, however, when she started losing teeth at 2 years old they went in to do the dental needing to pull a considerable number of teeth which were damaged. She seemed to come out of that fine but a week later she started having trouble breathing and her heart stopped shortly after I got her to the emergency vet. They were unable to revive her. While we don’t know for sure what happens the vet believes the condition in her mouth probably resulted in a more systemic infection/inflammation that weakened her heart. I am now much more proactive about dental health. My current cat gets her teeth brushed every other day and an additive on her food. She has also had two dentals in her 8 years with me both at the first sign of trouble (the first she was showing a little gum inflammation which turned out to be due to a cracked tooth, and the second she had a tooth with a resorptive lesion). She’s come out of both great. Hello, thanks for that. Unfortunately we don’t have any holistic vet around here so all I can resort to is conventional mainstream western medicine vets. The suggestion was that since gingivitis/stomatitis/whatever she has cannot be fixed (by their methods), we should just pull all the teeth. I did not like that suggestion so am now looking for other remedies which lead me to homeopathy and dental probiotics and was wondering what Ingrid thought of these. Anyway Kormi is now back to her usual healthy and perky self after a week of antibiotics from the vet, so I’ll go ahead and try those other things. Just in case if they don’t work I’ll consider the conventional option. I would be afraid of my pet biting down if I was using my finger. It might be a good idea to begin slowly so they can get used to the sensation. As I keep reading, I see that canned food is a really bad idea for dental health. I didn’t know that, but it makes a lot of sense! Thank you for this article! Actually, canned or raw food is a better choice for dental health than dry food – and for your cat’s health in general. You’re probably thinking about the myth that dry food cleans cats’ teeth, which is a myth that just won’t die, and is, unfortunately, still perpetuated by many veterinarians. 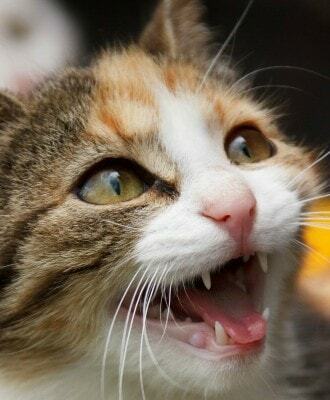 Dry food does not clean your cat’s teeth. Most cats don’t chew their kibble long enough for any of the scraping action that is the theory behind this myth to kick in. What little they do chew shatters into small pieces. Some pet food manufacturers offer a “dental diet” that is made up of larger than normal sized kibble to encourage chewing, but in my years at veterinary practices, I’ve seen many cats swallow even those larger size pieces whole. Additionally, dry food leaves a carbohydrate residue in the cat’s mouth that actually encourages growth of tartar and plaque. The moisture in raw or canned food actually helps “wash away” some of the residue all food leaves on teeth. Hi, currently running a search on EFAC tabs and came across your site. I have a tomcat (former stray) who is troubled with gingivitis and as he continues to get this even though brushing with Beaphar toothpaste regularly, so he has no plaque build up on his teeth, he continues to have sore gums and my vet suspects underlying causes, possibly Feline Stomatitis. Currently he has been injected with an anti-inflammatory drug for the pain and may have to return for another in 3 weeks but obviously it concerns me and I am looking for ways to help him, and avoid his condition becoming advanced and him losing all his teeth, if Feline Stomatitis is confirmed. Thomas is an 8 year old castrated tomcat. Actually there is something you can do about stomatitis, I control my cat’s with L-Lyseine treats, Duralactin and Plaque-Off. Does anyone have experience/thoughts on proden plaqueoff (https://www.amazon.com/Proden-PlaqueOff-Dental-Care-180gm/dp/B000QAEQXQ/ref=sr_1_2?s=pet-supplies&ie=UTF8&qid=1471114903&sr=1-2&keywords=proden+plaque+off). I had a vet recommend it for me when my cat had dental issues. I’ve been using it as well as brushing my cats teeth, but I’m always skeptical on whether or not it really does anything. I use Beaphar toothpaste, which is successfully keeping Thomas’ teeth free of plaque according to recent examination by my vet. There is no plaque build up present. I brush Thomas’ teeth with a little of the paste on my finger twice daily. He’s a sensible cat and he knows I’m trying to help him. He does have painful gums so sometimes raises his paw to tell me to stop and obviously I have to allow time for him to swallow also. I aim to use the same method with EFAC tabs in the hope that it may reduce painful swelling in his gums. My cat is 9- this past year he had to have 7 teeth removed from periodontal disease. I never knew that is a problem with cats having owned cats all my life – this is a first for me. I hope I will b able to save what he has left. @Elaine:My 8 year old tomcat Thomas has had three teeth removed earlier this year as a result of infection, since which I have stepped up my efforts to keep his teeth plaque free. In this I have been successful but he continues to have very painful gums despite this. I shall be trying all avenues but it appears he may have Feline Stomatitis and could equally lose his teeth. I am looking at ways to prevent his gums being painful and EFAC tabs seem to be a step in the right direction. Beaphar toothpaste has worked well for us in removing plaque from Thomas’ teeth and so keeping his mouth free from infection following his extractions. I like what you said about only using toothpaste meant for cats. My daughter just got her first cat and I wasn’t sure if it was safe to use regular toothpaste on her teeth. Now that I read this, it sounds like I need to go to the pet store to get some special toothpaste and a pediatric toothpaste. Thanks for the help! Your tip to brush my cat’s teeth seems like a great way to prevent dental disease. I should probably start doing that for my cat now that I’m more aware of her risk for having dental problems. After noticing how she would gingerly eat her food, I took a look at her teeth and noticed that her gums look kind of dark red and a little inflamed. When I saw that my cat’s mouth looked like that, I started searching for other articles that have useful advice that will help my cat have good oral health. The link that goes to this article, http://catclinicofseattle.com/help-your-cat-live-a-long-healthy-life/, has a lot of really useful tips for preventing dental disease in cats. I think that the advice in this post about how common dental disease is for cats and how a good cleaning treatment can help them have healthy teeth and gums is really useful for other pet owners to know. I am quite interested in the EFAC! Topaz was due to have her teeth cleaned late last year but could not, due to signs of kidney failure. Now I am terrified of having her anesthetized to have her teeth cleaned. Perhpas this is worth a try. I will ask her vet. I brush Thunder’s teeth every day. Like you, it has just become part of the routine. He doesn’t really like it, but he tolerates it. I started with him when he was around 2. Very interesting information, I had no idea the dental treats and food don’t work. The EFAC – I’m wondering if I can use it if my cat has food allergies? I admit, this is something I really struggle with. My cats can be stubborn. Hi Ingrid, Have you tried smaller raw rabbit bones for your girls? My cat Tiger loves chewing and crushing them. Thank God, he never drags bones around the house only eats them on a towel, which I always use for his bone eating. Brushing Tiger’s teeth? That would be the day! But then, of course, every cat is different. Tiger is a passionate outdoors cat as are many other cats here in the UK. We love your Newsletters – thank you for them! I’ve only just started my blog about my holistic journey with Tiger. Ruby is allergic to rabbit, so we’ll have to steer clear off that. I’ll look forward to reading your blog, Majka! The EFAC sounds interesting – I wonder if I would like it. My human does brush my teeth, although she should do it more often (besides, I think the kitty toothpaste is kind of tasty!). Allegra and Ruby love the taste of the kitty toothpaste, too, Summer.